This third edition, in the same tradition as the second, is a vital servicing tool containing information covering virtually every motorcycle over 50cc sold in the UK since 1980. 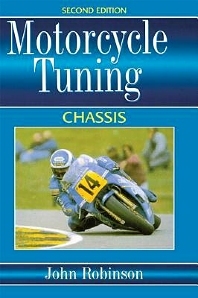 The author is technical editor of Performance Bikes' and author of the well knownMotorcycle Tuning' books. The book provides access to the most frequently used data for dealers, mechanics and enthusiasts who have to deal with a wide variety of machines and wish to compare the features of different models. A seperate section lists conversion tables, standard torque settings for threaded fasteners, tyre size codes, tyre speed and load schedules and addersses of importers. Machines are listed alphabetically by manufacturer and then in order of capacity or model number. Tyre sizes; Torque wrench settings; Conversion tables; A-Z of manufacturers: Aprillia, Benelli, BMW, Cagiva, Cossack, CZ, Dnepr, Ducati, Enfield, Gilera, Guzzi, Harley Davidson, Hesketh, Honda, Jawa, Kawasaki, Lambretta, Laverda, Morini, MZ, Norton, Neval, Serveta, Suzuki, Triumph, Ural, Vespa, Yamaha.